The creative and tech sectors are two of the UK’s most exciting and dynamic for exporting. In the fourth of a series of case studies looking at businesses carrying the flag for the UK overseas, we look at Mymanu. Precision engineered, truly wireless smart earphones with an extraordinary untainted high-definition audio quality APTX® POWERED. Where are you now with your exporting plans? Mymanu click is the world’s first truly wireless ear buds with live voice translation in 37 languages. We are looking to target the French markets first and we’re looking to re-label the products for them, localise the website to include a dedicated French page. We’re also looking at restrictions for audio products, identifying the main retailers and distributors and looking at how popular ecommerce is in France. We’ll visit any potential distributors we can work with, and we’re looking to do more PR and marketing campaigns in France. How has the Action Plan helped your business? It helped because we’ve managed to start implementing actions like identifying distributors and retailers for the French market. We’ve been in communication with them and it’s made us aware of the requirements and certification we need to look into and the labelling. It gave us insights indicating we can’t go to this market with the same packaging, but we need to go with new packaging. And how have you found the experience of the competition today? I always get nervous when pitching but I enjoyed it. 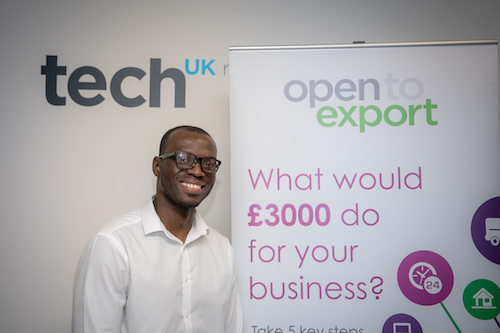 The Open to Export Action Plan is a FREE and EASY to use online planning tool for small businesses planning to sell overseas. Generate your Export Action Plan as a PDF report to share with your chosen adviser for a more productive journey to export success.